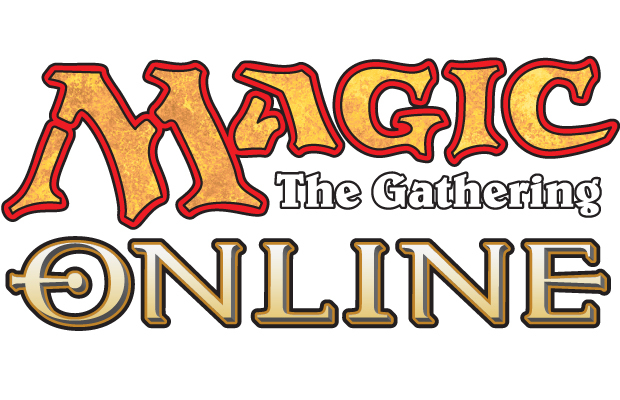 Today is the official release of the new face of Magic Online. It has been a long journey, so I want to talk a little about the importance of today's release, the contents of last week's update, and what you can expect in the future. I'll also provide a quick update on Leagues. Launching a new client is a big deal, and while the road hasn't always been smooth, we're excited about today's release and what it means for Magic Online's future, for several reasons. First, it provides a better interface for new players. Delivering a more traditional interface along with a focus on using plain language provides a clearer direction for players just getting started with Magic Online. For established players, we'll continue exploring additional features that will help them become more comfortable in the new client. Second, we'll be able to deliver quicker fixes with less downtime. While we won't be able to completely eliminate the dreaded downtime just yet, changes that only affect the client can be delivered without bringing the whole system down. This is a drastic departure from the previous client and has the potential to deliver updates faster than ever before. Finally, we can provide new and higher-quality features. Supporting a single client lets us focus on creating the best possible experience for our players, both in the types of features we can deliver and the quality of those deliverables. It also paves the way for additional improvements down the road that wouldn't be possible on the previous client. So now that we've made the switch, let's take a look at what's been added. We delivered another large update last week. We continued to focus on issues that support today's launch, including fixes for several memory issues and some crashes. We also released another set of trade updates. Cards that are both in your trade partner's binder and in your collection now have a quantity indicator to show how many you have, which improves the general trade flow. 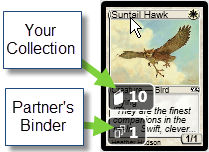 When using the Search Tool to compare your Wish List or decklist to your partner's trade binder, a special filter will apply to show only the cards that are that list. In Collection, we've fixed some issues that could cause Collection display issues after some completed trades, as well as adding a confirmation dialog for opening booster packs or other sealed products. In the Duel Scene, the player info box has been updated to be clearer, including a larger life total and new placement for the match clock. We've also added a more robust confirmation process for dropping from tournaments to prevent accidental withdraws. Finally, we've fixed the converted mana cost sort so that it no longer adds new CMCs to the right of the existing piles. Help got a big update to include an overview many of the most common features of the new version of Magic Online. This, along with our series of transition articles, will get you started on your adventure with the new client and is a big improvement over what was available in the previous version. If you want to see everything that is new, check out the full change list at the bottom of last week's announcement article. Well, right now Magic Online 12th Anniversary events are running, including Holiday Cube and Modern Masters Flashback Drafts. Hot on the heels of the Anniversary events, Magic 2015 Prerelease events start next Friday, July 25, with Release events starting the following Monday, July 28. Don't forget that each Magic Online account that has logged in since April 2008 will receive one of each Magic 2015 Hunt Prerelease object and 35 Phantom Points added to his or her account on July 23, good for a Magic 2015 Prerelease Sealed Deck event on us. For the new client, our next update will focus on any problems that arise post release. Of course, our first and foremost goal will be maintaining our stability and performance, so fixes in this area will always take precedence. Beyond that, we'll be focusing on getting replays working correctly in all instances. Right now, you can only watch replays of casual one-on-one matches, and fixing tournament and multiplayer replays is high on our priority list. We'll also be focusing on fixing bugs around the major features released over the last few months, including the targeting and associations work, the trade updates, and more. Further afield, we'll be looking at updating how event standings are shown, adding the ability to hide event and game windows, improving how the graveyard and other zones are displayed, exploring ways to increase card size on the battlefield, making further refinements to card display and chat. As always, we want to hear from you, as your feedback will continually help us prioritize outstanding work. You can continue to use our feedback form, the forums, email at MagicOnlineFeedback@wizards.com, or Twitter (@MagicOnline) to let us know what you think or what features are important to you. We're currently looking to launch Leagues in late fall. While we aren't quite ready to announce an official date, we've continued to make good progress. If you are unfamiliar with what Leagues are, my last article provides an overview of how they will work. In a nutshell, Leagues let players play matches of Magic for prizes on their own schedule, rather than requiring them to carve out three or more hours for a tournament. Here are a couple preview screenshots from our current internal beta test that show a little about what is in store for the Leagues release. Note that the images below are from our internal beta and may not exactly match the final release. Leagues you've joined will always be available from the Home scene, so as soon as you've logged in you hop right in and find a match. You'll also be able to see how many matches you have left and other League details. 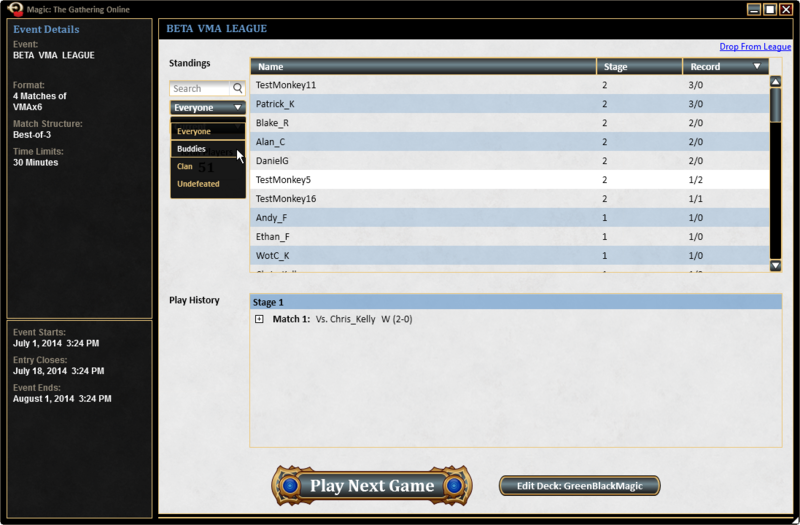 Once in the League details, you can play a match, edit your deck, or review the League standings. Filters are available for standings so you can check on your buddies and clan mates who are in the same League. Of course, your entire play history is also available, including previous times through the League, should you want to relive past glories. We are very excited about the opportunities Leagues bring and can't wait to share more as we get closer to their release. The upcoming months are a very exciting time for Magic Online. Magic 2015 is just around the corner, and Khans of Tarkir and Leagues arrive this fall. In between, we should have an update about Premier play on Magic Online, not to mention regular updates to the game client throughout the year. Don't forget to check out our series of transition articles to help you get acclimated to the new version. Thanks for all your support so far, and a have fun slinging Magic cards all summer long.